If you love eating fried foods and want a healthier alternative then the Farberware Air Fryer is the perfect kitchen gadget for you. In this detailed review, we are going to talk all about this Airfryer from Farberware and how it can be useful for someone planning to lose weight but still cannot give up on French fries or Chicken Wings. The Airfryer from Farberware helps you cut down those calories by using very little oil for frying in comparison to the deep fryers where you are going to use a ton of oil which does give you a good taste but is loaded with tons of fat. 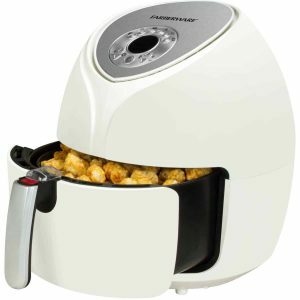 If you are planning on getting an Airfryer from Farberware then do read this detailed review on the two Farberware Airfryers and figure out which one best suits your needs. One of the best reasons you can get a Farberware air fryer is the fact that they are super affordable in the air fryer range and come with the best features. This Air fryer from Farberware is one of the popular Airfryers and if you get one of these, you are certainly not going to be disappointed with its features. 1. Uses very little oil, around 1 tbsp for cooking French fries. 2. Gives taste which is similar to deep-fried foods. Most of the Airfryers make the food dry but this one from Farberware does its job pretty well. 3. You have a timer which can be timed up to 30 minutes and a temperature controller making cooking easier. 4. Auto Shut off feature which saves energy in the long run. 5. The cooking capacity of the Air fryer is around 2 lb. 6. The Airfryer is easy to clean and the parts of the Airfryer is dishwasher safe which includes the food basket and the basket holder. 7. Cooking in the air fryer does not release any odor which is important if you plan on cooking something while guests are at home. 8. You can cook steak, potatoes, make grill cheese sandwich and tons of other dishes with this air fryer. 9. The Airfryer takes really small space on your kitchen counter. 1. If you are cooking large quantities of food then you might want to cook in batches. So if you plan on cooking for guests then you might want to get started before they arrive. 2. The plug might be a little smaller and you need to keep the Air fryer near a plug point. Personally, the thing I liked about this Air fryer is that it cooks food very fast in comparison to other Air fryers. 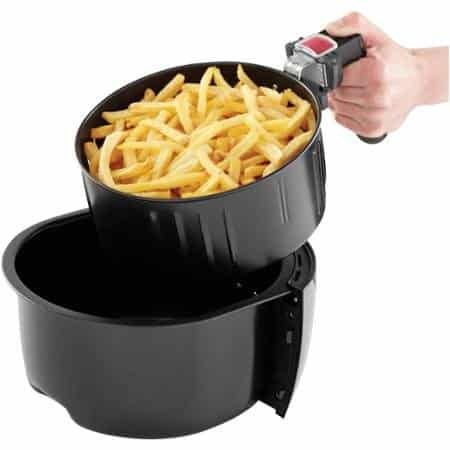 It takes around 7-8 minutes to cook a batch of french fries which is pretty quick in comparison to most of the Airfryers in the same given price range. Taking a look at the price of this Air fryer and its feature, I would definitely recommend this to anyone as it has the best price/feature balance. This is another Airfryer from Faberware with Digital controls and a few advanced features from the previous Air fryer. This Air fryer has a larger capacity so if you are planning to get an Airfryer to cook for your family then you should definitely choose this one over the previous Faberware model. 1. This one here comes with a digital control and you can set the temperature and time and get started with cooking. 2. The air fryer is really quiet while it is working which means if you have guests over, you can use it with ease. 3. The Airfryer is easy to clean and dishwasher safe, similar to the previous model. 4. There is no odor of the food while you are cooking it in the air fryer which is another advantage. 5. You can cook almost anything in the fryer which includes, grill meat, baked potatoes, cook vegetables, etc. The best dish however for me was Chicken Wings and in the case, you have not tried making them on an Airfryer then I recommend that as your first dish. 6. The Air fryer comes with a really large capacity which is around 5L of the cooking basket. 7. It cooks food really well and with minimal oil gives you a fried taste which is amazing. As mentioned before most of the Airfryers tend to dry out the food but that is not the case with this Air fryer. 8. It is easy to use and maintain. It also comes with an Auto Shut off feature which saves energy in the long run. 1. You might want to keep it close to a plug point as the cord might not be long enough. 2. You might need to remove the cooking basket out in order to turn the food that has been cooking in the Air Fryer. If you are looking for such huge capacity air fryers then our best recommendation would be the Power Air fryer ovens or the Philips Turbostar air fryer. Both these air fryers are huge and can cook a lot of food really fast. They are perfect to cook in for Thanksgiving and other family parties. If you are looking for something this festival season then you should definitely check out these two airfryers which have a similar price point as this one from Farberware. 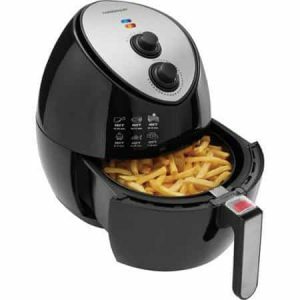 The best feature of the Farberware Air fryers is that they cook food really fast. They are faster than most of the Air fryers in the market and for the price range that they are available in, I would say that they are the perfect option for someone who is looking for a healthy alternative. Both the units from Farberware are pretty amazing and you can go for the one that meets your needs. If you are looking for an air fryer for one or two people then you can go for the first air fryer otherwise in the case you want something that could cook relatively larger quantities of food at once then the digital Air fryer from Farberware would be perfect. In any case, do check out both the Airfryers and let us know what you think in the comments down below! Do you know any health freak that would love Airfryers? Share this post on their social media pages and let them know about these amazing Airfryers from Farberware! Con: the basket holder and basket liner started peeling off, unit is less than 6 mo. Old. Don’t want my food cooked with silicone liner peelings. I have heard quite a few complaints about the same issue. I guess going with Philips and spending a bit more than one normally would do make sense. They Didn’t work at all? Did you try getting a replacement?